Behringer B212D Powered PA Speaker; Ultra-compact and light weight system delivers excellent sound even at extreme sound pressure levels. Thanks to our revolutionary Class-D amplifier technology and internal switch-mode power supplies, EUROLIVE D Series loudspeakers provide a much better power-to-weight ratio than competing active speakers. Put simply, you get all the power without the back-breaking weight. Due to their high-efficiency design, they crank out 550 of the cleanest, punchiest audio Watts you've ever heard from a compact loudspeaker system. The integrated sound processor provides total system control, along with dependable protection of the LF and HF transducers, thanks to the built-in active high-pass filter, which virtually eliminate distortion — even at extreme operating levels. In addition, all four models feature an Ultra-Low Noise (ULN) Mic/Line input with LEVEL control and a dedicated 2-band EQ (bass/treble) for easy control. Outstanding quality of sound from such a small speaker! Very good for portability. These are definitely my go-to speakers for the smaller performances and also great for stage monitors. Highs Mids and Lows this gives me everything! I combined it with two 1320Ds and rocked the national guard armory. Will be buying another soon! started with 3, for monitors, clean, loud, sound prety dam good, has high and low eq, lot theyl bark when needed, need to run with lows cut back (muddy) these are full range, not subs, if your looking to feel the bass buy a sub, how ever for a small p.a. for acoustic or small areas they work and sound great, i bought 2 more, iv'e used them as 5 momitors(with 2 eurolive b815 neo's as mains with subs), 2 as mains only, 2 as mains with 1 sub, 2 as mains with 2 subs, i used 1 for my coustic guitar as amp (awesome) when the bass players amp took a crap, he played, and kept up with the rest of the band at stage volume, 2 hours or more, with no issues. cant go wrong with this speaker, spec for spec it in there, yeah its not maybe as smooth as a speaker 2 times the price, bjust use a bit of e.q. So I have had these for a few years and they are great when coupled with a Behringer subwoofer. Some dj gigs I didn't bring the sub and after 6 hours of continuous music and loud, they get hot and the sound is not as clear and crisp later on the night. I think they get overworked and the bass in them is weak and gets weaker a few hours after playing. 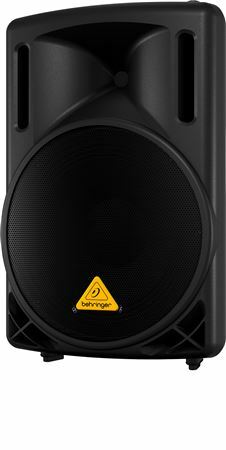 Definitely will upgrade to the bigger Behringers or JBL but for professional Djs you have to take that into account. I really like the sound of this speaker. Really. I had 2 sets of them. But I blew out the crossovers in 3 of them in 2 years leaving me with only the horn each time. Also the speaker pots get really noisy in time after continued use every week.